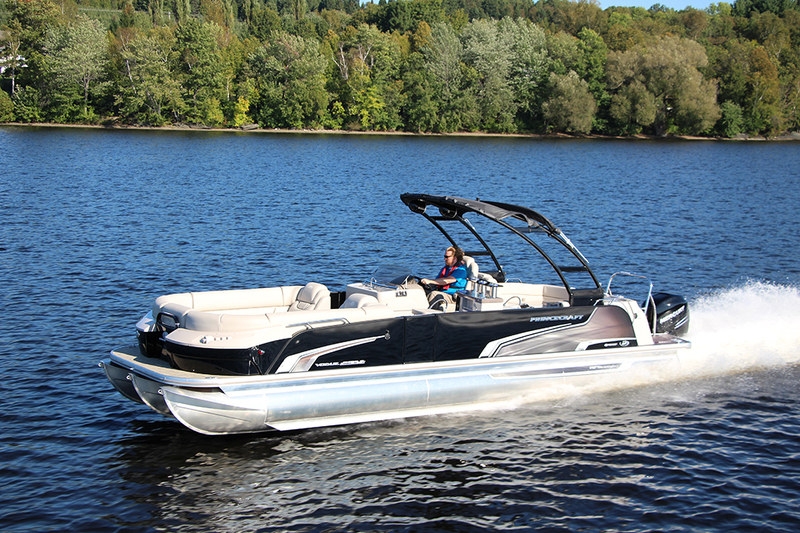 This fall I travelled to Quebec to get my hands on the prototype of Princecraft’s all-new Vogue 29 SE. There was still a little tweaking to be done so running the full numbers wasn’t an option, but top speed was stunning for a pontoon this size and the acceleration the 350 horsepower Mercury Verado delivered was nothing short of impressive, helped with the full-length lifting strakes. 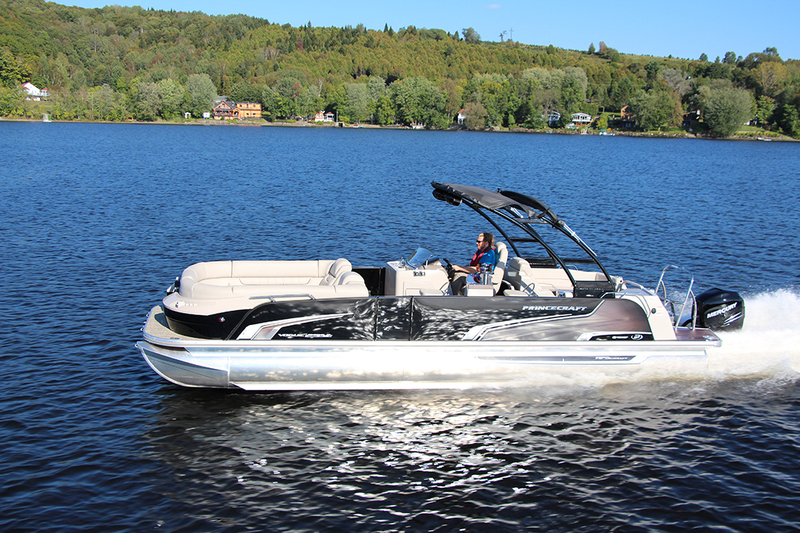 As tested, the Vogue 29 SE had the performance configuration that includes under-deck spray shield, lifting strakes and three-log set-up with an in-floor storage locker. 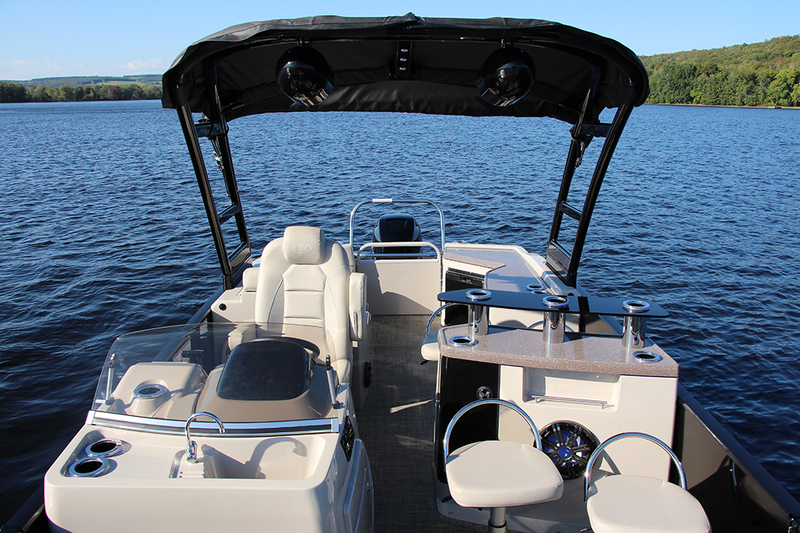 It also includes the optional wakeboard tower with massive rider-facing speakers and Bimini extensions. It looks fast and it looks good too. Along with the aforementioned tower, there are integrated LED lights at the bow, premium graphics options and three choices of colour: carbon bronze, silver champagne or, as tested, black metal flake. 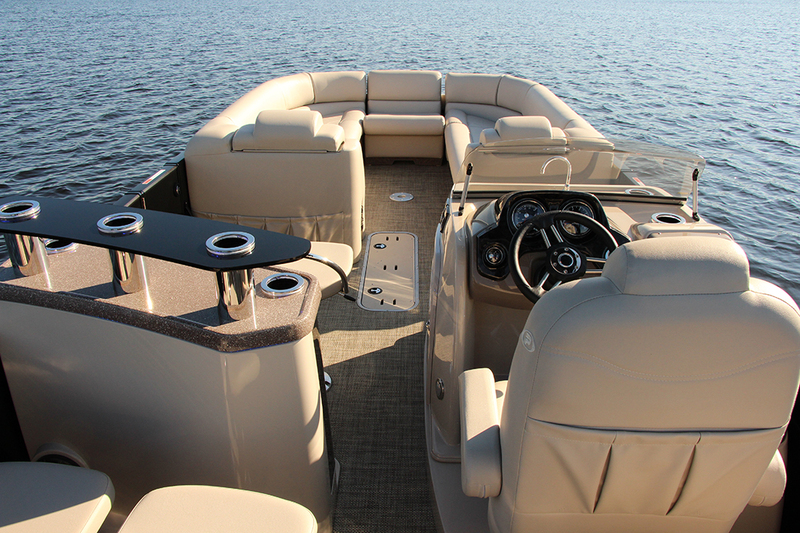 On board, the faux leather seating is plush yet durable on both the benches and the bucket seats. In the premium package, the helm is raised and there’s an amped up audio system with everything you’re looking for from Sirius XM to Bluetooth and a USB input. 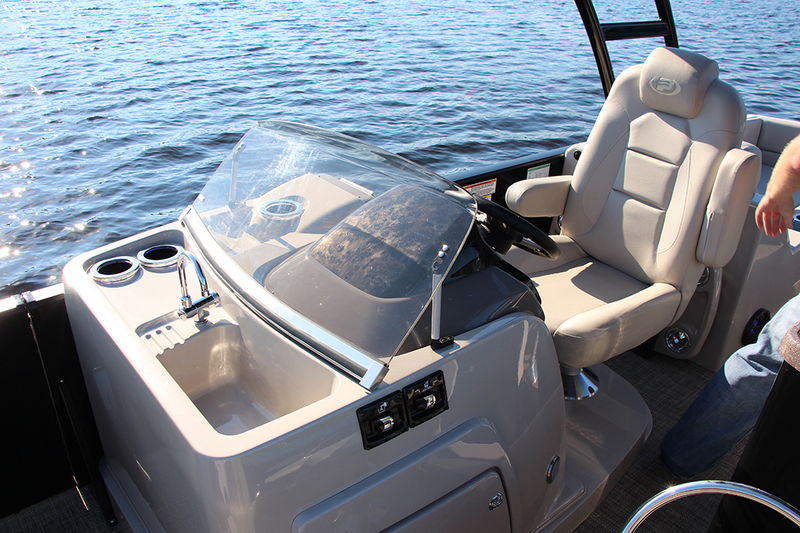 Along with adjustable seat and steering and raised line-of-sight the captain’s area has a molded dash with black pearl wood grain inserts and a multi-function display that even features a rear-view camera. On the front side of the helm console is a sink and cup holders. Directly opposite is the bar with four stools flanking the bar-top with LED-ringed cup or bottle holders. Underneath is a massive storage compartment. While the bow is wraparound bench seating, including a hideaway chemical toilet, the stern is the party zone. On the port side is a fridge and counter space behind the bar, while the starboard side has a lounger for those wanting to relax where the action is. Whether you’re ripping across the water or partying at the dock at dusk, you’re going to do it in style on the Vogue 29 SE.